The Brewers have slipped back to their losing ways this week. They lost 2 of 3 against the White Sox at Miller Park and 2 of 3 against the Mets in New York. In roster news, Jean Segura was placed on the disabled list and Scooter Gennett was optioned to AAA Colorado Springs. Carlos Gomez was hit in the head and came out of the game on Sunday, but it looks like he will be OK. The Brewers started the series off against the White Sox by giving up a 6 run lead. They were up 6-0 after 4 innings and 7-2 after 5. The White Sox scored 3 in the 7th and 2 more in the 8th to tie it up. 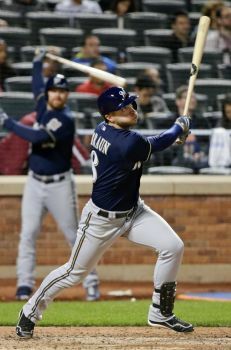 Elian Herrera hit a 2-run home run in the bottom of the 8th, his second straight game with a home run, and Khris Davis added another home run to give the Brewers a 10-7 victory. Chris Sale baffled the Brewers in game 2 of the series in his first appearance after a 5 day suspension. He pitched 8 innings, giving up 2 runs on 3 hits while striking out 11. One of those runs was a home run by Herrera, his 3rd in the last 3 days. The Sox scored 2 runs late in the game to snap a 7-game road losing streak with a 4-2 win over the Brewers. Jimmy Nelson gave up back to back home runs in a 3-run first inning of the final game of the series. White Sox pitcher Jose Quintana made sure that the lead held up, pitching 7-plus innings and striking out 10 batters. The Brewers scored a run in the 8th and 9th, but fell for the second straight day by a 4-2 score. Kyle Lohse had his best game of the season so far in the opener against the Mets. He pitched 8 innings and only gave up 2 hits while striking out 8. Ryan Braun hit 2 home runs and had an outstanding diving catch in right field. Gerardo Parra added a home run and the Brewers took game 1 of the series 7-0. The wheels came off in game 2. Matt Garza only lasted 3.1 innings, giving up 10 runs. The Mets scored 10 runs in the 4th inning on their way to a 14-1 win over the Brewers to snap their 5-game losing streak. Brewers shortstop Luis Sardiñas, who was just called up, went 2 for 3 and scored the Brewers’ only run in his first Major League start. The Brewers’ bats were silent once again as Noah Syndergaard recorded his first Major League win. Wily Peralta gave up 5 runs in 5 innings in his 5th loss of the season. There was a scary moment in the 6th inning when Syndergaard hit Carlos Gomez in the head with a 97 mph fastball. Gomez left the game, but he did not suffer a concussion. He did, however, have an ear flap shaped bruise on his cheek. Jean Segura was placed on the disabled list on Thursday due to a broken pinkie. He broke the finger sliding in to third base 2 days earlier. Segura was unhappy about being placed on the DL, and manager Craig Counsell likes that. The Brewers brought up Sardiñas to replace Segura. Sardiñas started Saturday’s game against the Mets and went 2 for 3 and a run scored. Aramis Ramirez returned to the lineup on Friday after sitting out the previous 6 games with lower back tightness. He went 3 for 4 with an RBI in the Brewers 7-0 win over the Mets. Jonathan Lucroy continues his recovery from a broken toe. He was cleared to catch bullpens on Friday. The only remaining hurdle is running, which may come soon. The Brewers are hoping to send Lucroy on a rehab assignment as soon as next week. Lucroy is now wearing new cleats from New Balance that has a protective carbon fiber toe cap. Scooter Gennett was optioned to AAA Colorado Springs. He had been struggling at the plate this year, hitting just .154. Since coming off the DL on May 5, he has just 4 hits and 7 strikeouts in 36 at bats for a .111 average. The Brewers called up pitcher Corey Knebel to help an overtaxed bullpen.